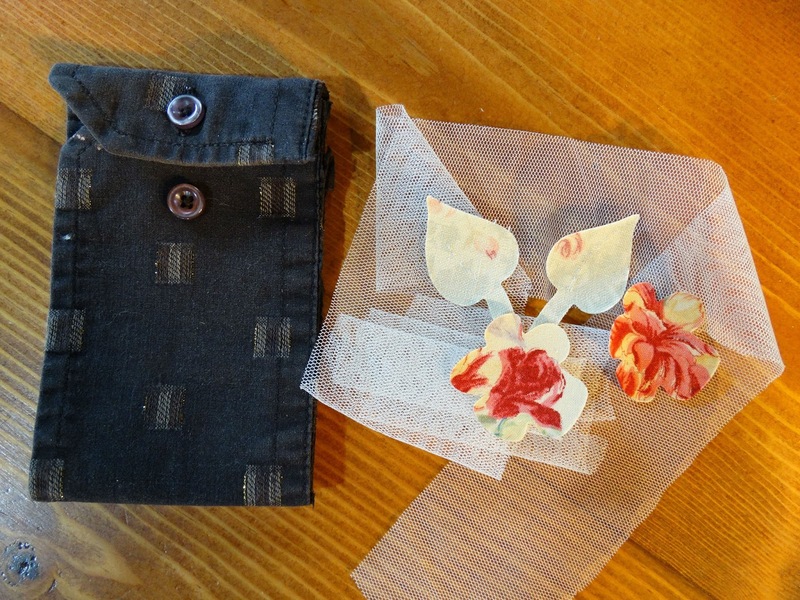 I’m about to be featured on a wonderful upcycling blog from down under! The post goes up in the next day or so. 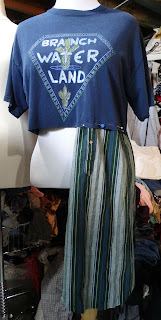 The blog is called Rude Record and they are masters at the upcycling and reusing game. So be sure to check them out and my blog post. There are even pictures of my messy sewing “studio”. So in celebration, I thought I would post a tutorial of one of my favorite dresses to make. So without further adieu, here is my tutorial for the shirt-sleeve dress. A knit or button down the top shirt that fits you well. Two to four men’s cotton long sleeve shirts. A manikin is helpful but not mandatory. Sewing supplies (pins and such). 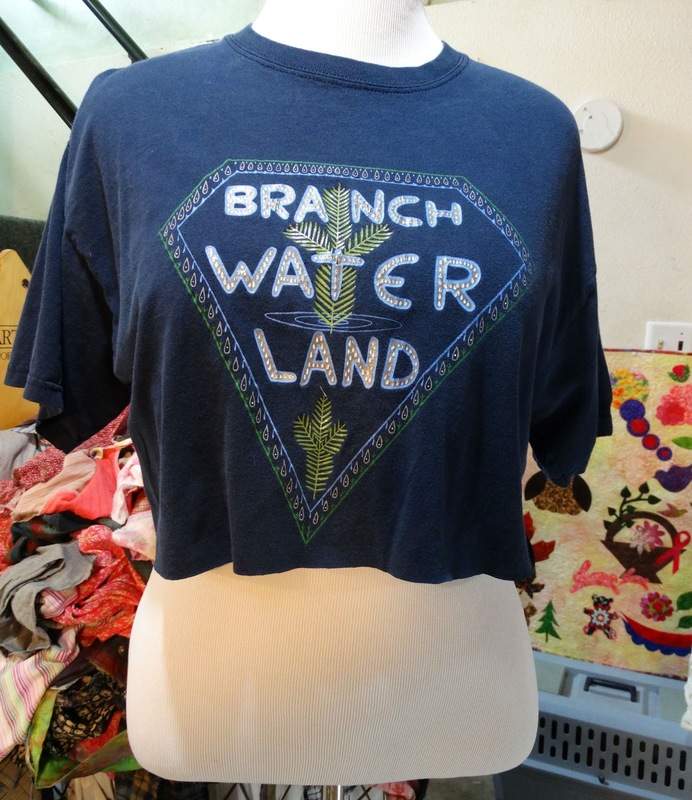 Start out with a top. It can be a favorite t-shirt, knit top or button down the front top. 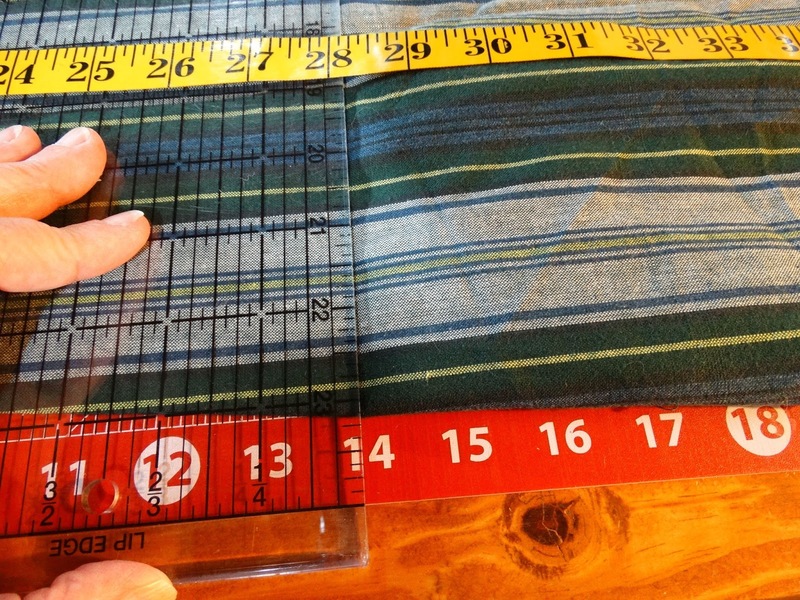 Measure down from the armpit seam about 6 to 7 inches. If you are big busted, you will want to go with 7 inches. 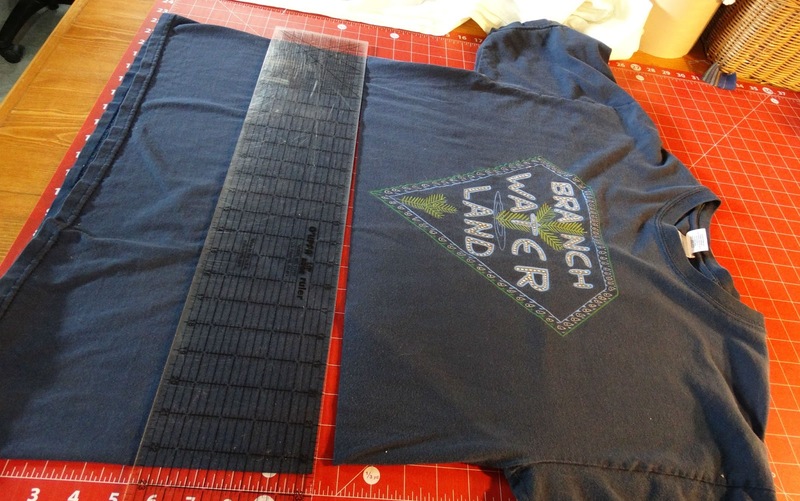 I use a ruler and rotary cutter, but you can just as easily use scissors. Just try to cut a straight line. Put it on the manikin if you have one. You can still manage without one. It is just a bit easier with one. Cut the sleeves off of the men’s shirts as close to the shoulder seam as possible. You will need four sleeves. 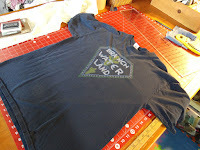 Cut along the sleeve seam to open up the sleeve flat. I usually iron it at this point. Button up the little slit where the cuff use to be. Sometimes I sew a little line to hold it shut. If it doesn’t have a button, you want to sew it closed. Pin the first sleeve on underneath the top at the narrow end of the sleeve. I pin about an inch under the raw edge of the top. 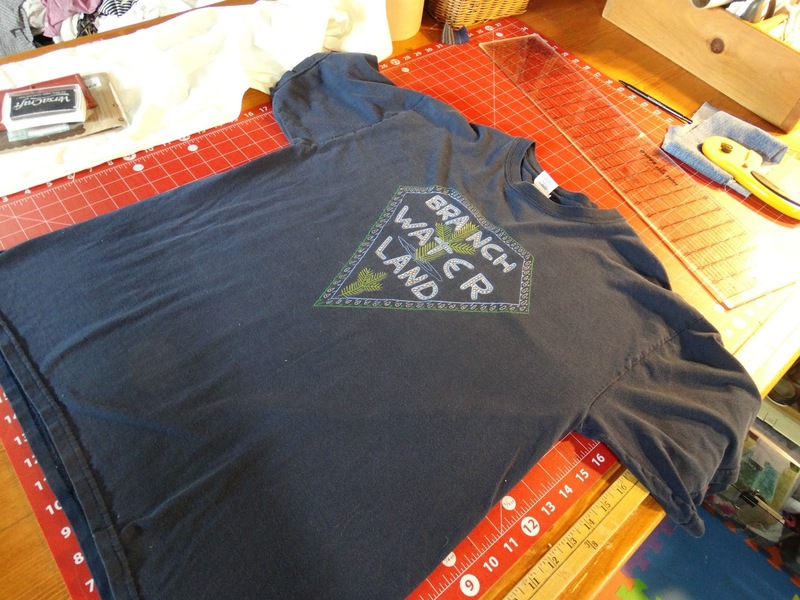 Continue pinning and overlap each sleeve a bit. 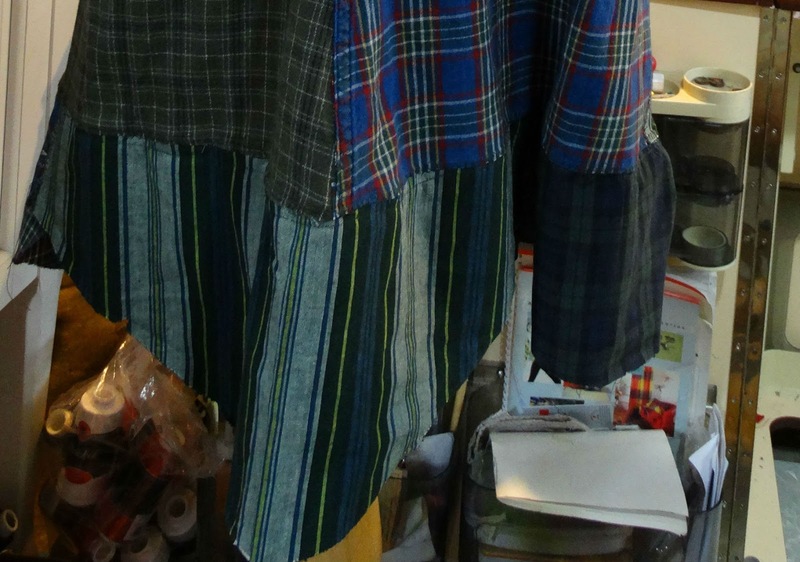 Pin the long edge of the sleeves together for sewing later. 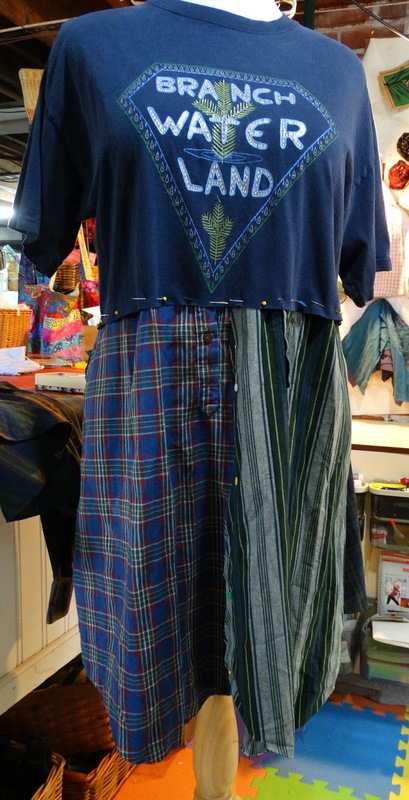 Usually four sleeves are enough to go around up to an Xlarge top. Over lap as much as needed to make the four sleeves fit. Unpin the sleeve skirting from the top and sew up the side seams sewing all the sleeves together. 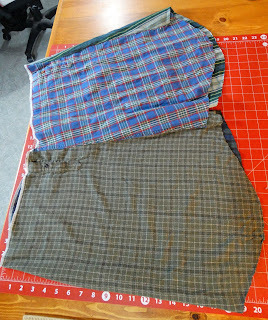 Lay the skirt on the cutting mat and fold it up until only one sleeve is showing. 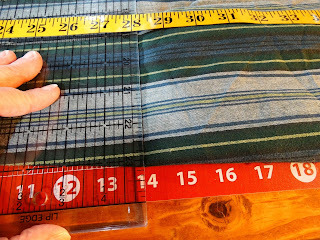 Measure down fourteen (14”) Inches from the top and using your ruler and rotary cutter, cut across the sleeve skirting through all the layers. 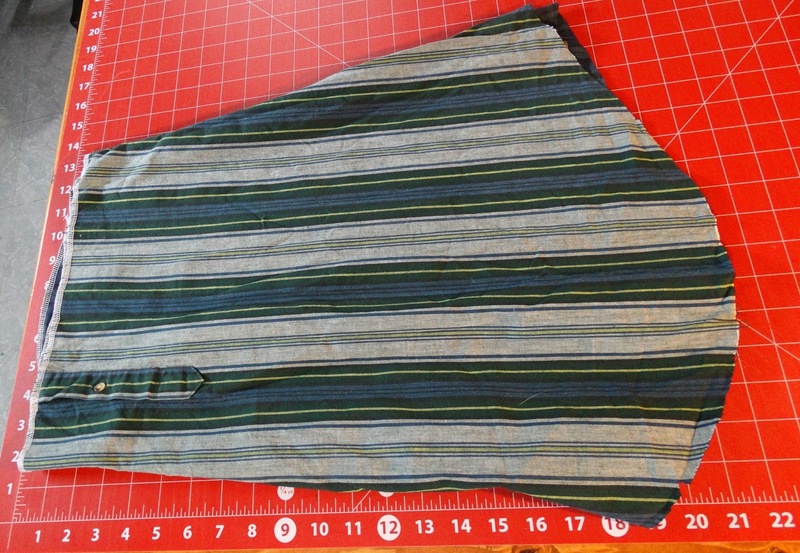 Pin the top part of the skirting back onto the top and sew with a zig zag stitch. 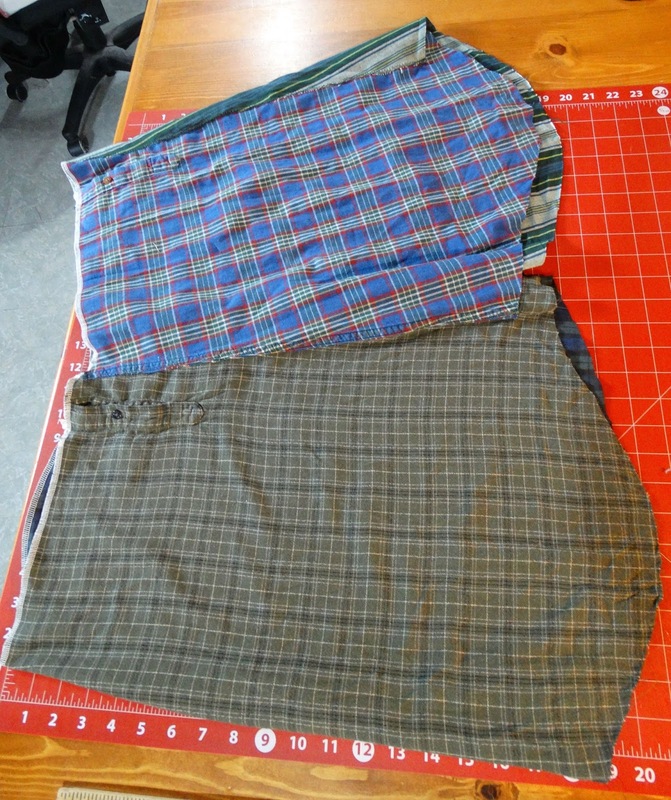 Arrange the part you cut off back onto the skirting, only offset the fabrics so seams and fabrics don’t match. You might need a few tucks here and there. That’s OK. Just do what you need to make it fit. Sew it to the top skirting with a zig zag stitch. The bottom should look something like this. I have decided to add side ties to this one. But just haven’t sewn them on yet. 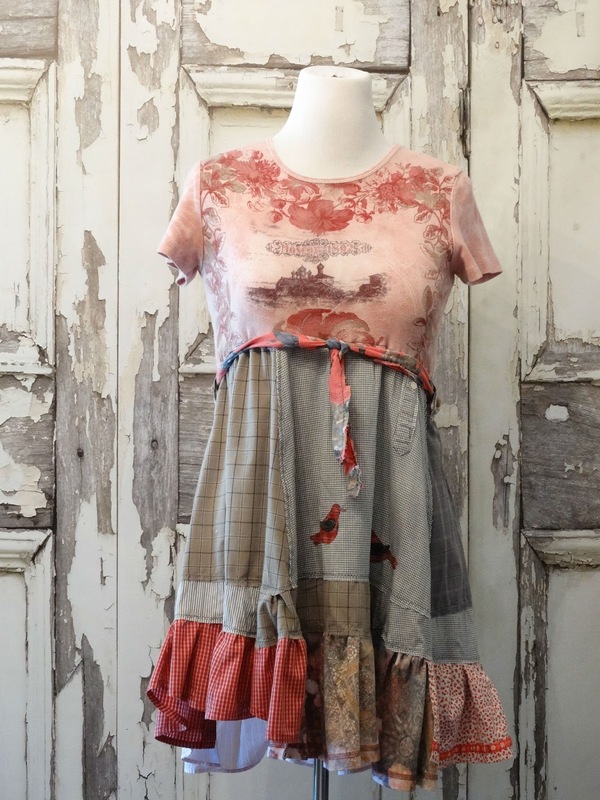 You can cut the top skirting even shorter if you want and instead of adding the bottom back on, you can add bits of lace, linen strips… anything else you might find that fits. 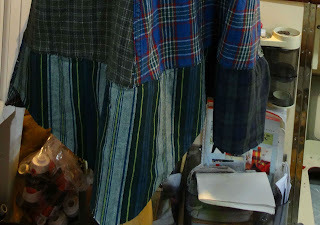 I actually cut a strip from the bottom part of the removed skirting and added the ruffle of other scraps for color. 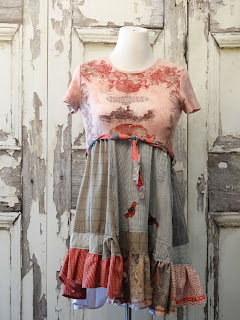 This is a wonderful dress to experiment with and use up all kinds of bits and bobs. Oh dear! I just realized how messy my sewing room must look. It does get a bit out of hand at times. (How embarrassing!) I was just too excited about the post for the RudeRecord! But there you have it. 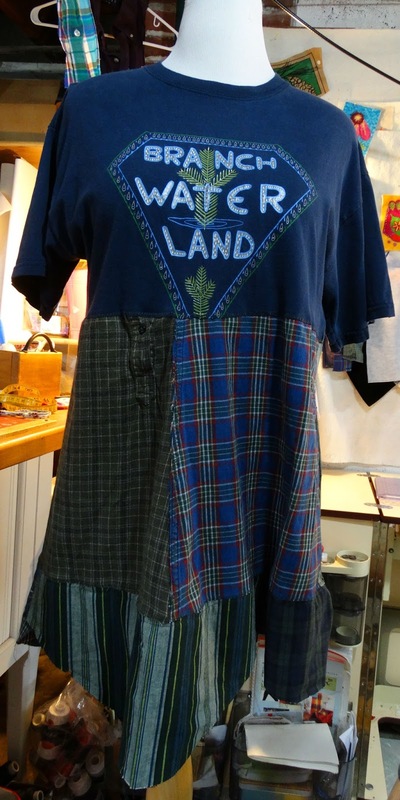 My favorite shirt sleeve dress. If you pop over to the RudeRecord blog you can see a few others I have created.